Taking notes on the iPad is a natural fit. Whether it’s quick bits of information you need to remember or longer pieces, having your notes easily accessible is a necessity for most users. Apple provides an answer to this with the built-in Notes app, but the faux-leather look of the notepad, and the unpopular-in-many-circles Marker Felt font leaves people looking for alternatives. (At least until iOS 4.2 arrives in November with more font choices for Notes.) HelvetiNote by Rage Digital offers a simplified alternative, with some notable shortcomings. Duly Noted: An alternative to the iPad’s built-in Notes app, HelvetiNote offers a sturdy and clean interface. You can even augment your notes with basic line drawings. Like the font after which it was named, HelvetiNote has a sturdy and clean look. The app has the same basic layout in both portrait and landscape view. Your notes are listed in a column on the left of the screen, and the right of the screen is dedicated to the note you are editing. When in landscape, the left column takes up one-third of the screen, leaving the rest for the note. In portrait mode, the two columns are split down the middle. In either view, a small arrow above the notes list lets you slide the column off the side of the screen, allowing the note in focus to be edited on the full screen. New notes are created by tapping the plus sign above the note list. Each note has a larger title (“new note” by default), that can be customized. (Choose your title wisely—more on this later.) The area below the larger title is lined, and contains the body of the note in a smaller font. HelvetiNote also allows you to add basic line drawings to each note by tapping a small pencil icon in the upper corner. Just like many other drawing apps, you draw by dragging your finger across the screen. There are minimal options for drawing: You can use an eraser to remove portions or the drawing, or you can remove the whole drawing altogether. 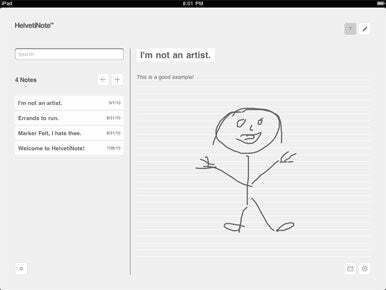 HelvetiNote is a note-taking app, not a drawing app, so the basic tools are adequate if you’re just looking to jot down a quick visual reminder. All notes, including drawings, can be e-mailed from within the app by tapping the letter icon in the lower corner. You can customize HelvetiNote’s color scheme by tapping the setting icon in the lower corner. There are four built-in themes: black, white, grey, and yellow. These adjust the color of the background, the color of the text, and the color of the menus. You can also customize your own colors by adjusting the sliders on the settings panel. Up to this point, the layout and design of HelvetiNote make it appealing on first glance; however, the app becomes less appealing in a number of key areas as you use it. One of the key features of a note-taking app is search functionality. If you’re using an app to store a wide range of random bits of information, it’s not going to be very valuable if you can’t access them quickly. HelvetiNote has a built-in search feature, but it only searches note titles not the bodies of the notes. That means if you have a note called “Favorite Restaurants,” for example, you won’t be able to pull it up if you search by the name of the restaurant. You also can’t sort notes by the date they were modified, and there’s a lack of syncing capabilities with the Web, desktop, or iPhone. Let’s go back to that Favorite Restaurants note—if this is a note you add to over time, you might want to be able to sort by the date you made changes to that it pops up to the top of the stack. Instead, HelvetiNote’s insistance on using the date the note was created will keep every new note above it. Syncing between devices is important to many people, and is built in to the default Notes app as well as other popular alternatives like Simplenote. Looking for an alternative note-taking app on the iPad in these pre-iOS 4.2 days is not surprising. HelvetiNote has a clean design that offers a reasonable alternative, but anyone expecting to put the app to heavy use should be aware of its shortcomings.